Yesterday when I picked up my husband for our weekly lunch date, we noticed the ducks were back in town. My husband's company has a large pond outside their corporate headquarters that the ducks migrate to every spring. One flew right over our car and did a beautiful landing into the water right in front of us. It was exciting to see. I actually live near a river, so I get the privilege of seeing ducks, cranes, and other waterfowl every time I get into my car to leave home. They are so fun to watch. I never get tired of it. Well even though I, as a female, enjoy ducks too, today's card I made for a man. To make my card, I used retired Stampin Up! sets 'Definitely Decorative Pines', and a sentiment from 'Wishing Well'. 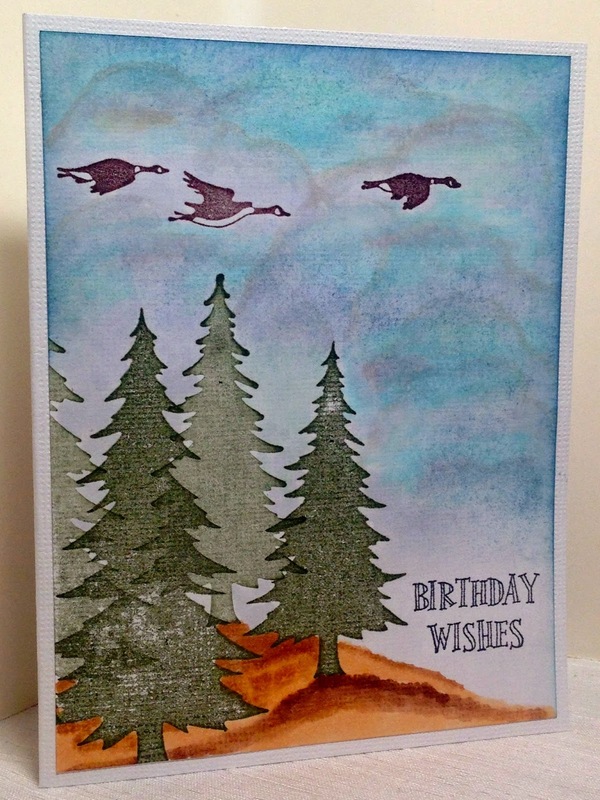 I stamped the pines and ducks, and then just colored in a sky using different Copic Markers and made some little earth hills. A very simple card, with the exception of the sky.